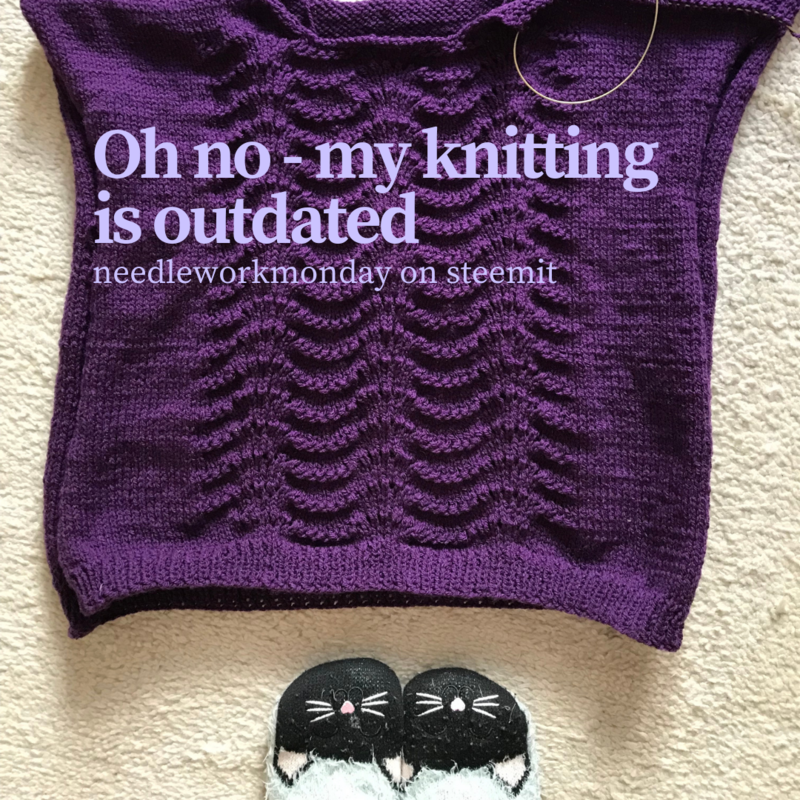 I am outdated, outdated by my own knitting. Wow what an avowal. I must accept I will never be on vogue with my knitting. And you have every right to learn why. I think it is the concurrence of me loving beautiful designs and me being a slow crafter. Shiny pictures of beautiful women in grandiose landscapes who are wearing dresses blown up by a stormy breeze and kept warm by a knitted sweater trigger a kind of primal response from me. I want to re-enact this instantly. Means: I want to sew this dress and knit this sweater and believe this will transform me into this mysterious woman who perhaps stands at the beginning of an amazing adventure. But pictures missing the women are also triggering my crafting reflex. It’s enough to show me some yarn photos – preferably hand dyed speckled yarn with pink and petrol – and I will start a new project. And then there is Instagram and Pinterest and (beware) Ravelry, not to mention all the amazing magazines and books full of patterns. I am helpless in the face of all this tempting clothes which are potentially only a click (of hook or needles) away. Only yesterday I meet shinysuperhero on instagram and not only is she an amazing designer, she was also super nice and helpful. And – yes you are guessing right – her designs are tempting me to again start another project, a funny and bright summer shirt, her Ellen Tee in intarsia technique. So if I have so many modern, artful and amazing patterns at my fingertips, why am I outdated? Because I knit soooooo slooooowwwww (the many letters are mimicking me writing like a snail). 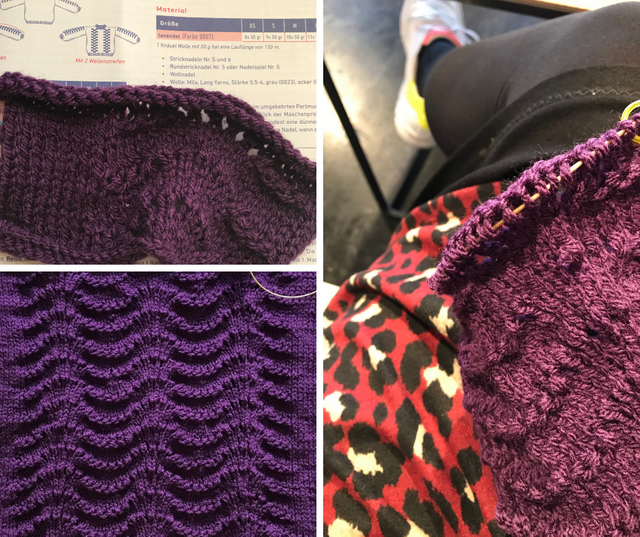 I last year bought this wonderful new magazine fibremood (huhuhu dear owners of fibremood, don’t you want to pay me, I so often write lovely post about your designs 😂) and I started to knit the lila sweater. And I still knit, and knit and knit… as I knit several other lovely projects… And now if I look out of the window I see a bright big sun and if I look at the thermometer I see 20 degrees and upwards. Then my eyes wander to my unfinished lila sweater and I see a wonderful thick winter sweater without sleeves. If I would only knit this sweater from now on, I guess it would be ready for summer 😂😂. You understand now? My knitting is outdated. One possibility to overcome this problem would be to start clothes I want to wear in summer already in winter or autumn the year before… Are you doing this? Are you planning your handmade clothes in this way? For me this is tough, as I am so tempted by pictures, colours and designs and I am not sure if it would be worth it to plan my hobby more. But I am highly interested in your handling. Back to the beginning of my musing: the warm and autumnesk lila sweater. I finally finished front and back of this sweater and the next step is to close the shoulder seams. The pattern told me to cast of the life stitches of both shoulders together. 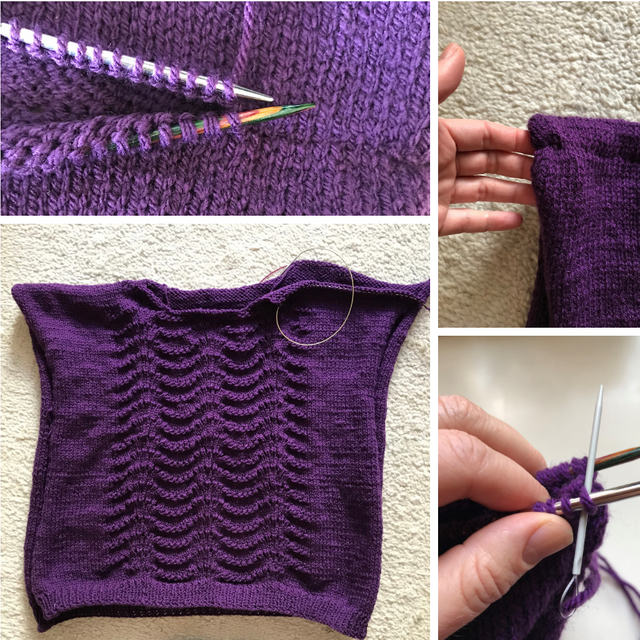 Sadly the pattern didn’t told me how 😀 I darkly remember two methods to cast of two rows of knitting together, the three needle bind of (which coincidentally @shanibeer describes detailed in her actual post) and the Kitchener stitch. I have chosen the latter. As I only did this once on a sock (which is still waiting for me to finish it partner) I hade to research again and stumbled about this YouTube video. The video is in German but with English subtitles. Her explanations are precise but I nevertheless made mistakes, because I misunderstood her. Firstly she explains the technique with ‚standard‘ western knitters in mind (which I am not) and secondly she advises to pull the thread strongly to close the knitting. I pulled a tiny bit too strong and created a puckered seam 😱😱😱 Not her mistake as she shows the technique very well on her video. And I may or may not had the same amount of stitches on both needles (the latter is indispensable for the Kitchener stitch)… I fumbled a bit and compensated my uneven stitchcount. The shoulder seam I worked is ok. I guess it looks better than a sewn seam would have looked, but it is far from perfect or invisible. I will practice the Kitchener stitch on my second shoulder and hopefully I will get a wonderful flat seam.